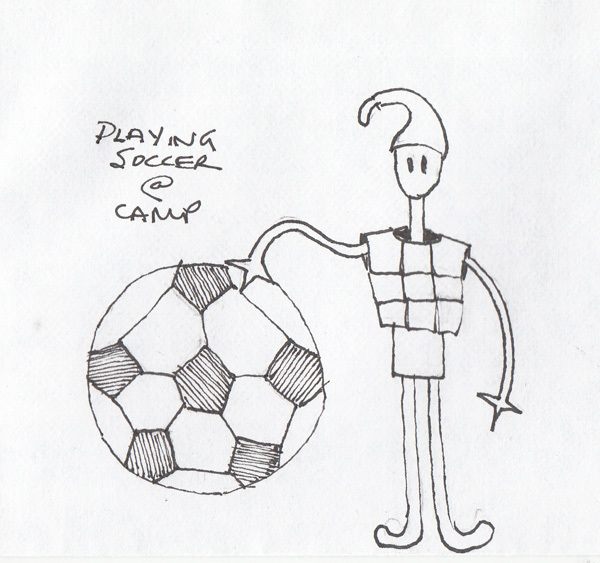 Last week I used the daily camp photos to determine the subject of my Axel drawings on the envelopes of my letters. My two grandsons seemed to be photographed most frequently with a football, and my grand daughter, a passionate soccer player throughout the year, was photographed playing a soccer game. These are the drawings I created. I'm enjoying figuring out how to draw Axel in many different poses - which is something good for my practice of drawing from my imagination. I'm writing my last letter to the 3 of them before they return to NYC. This week, the drawing is the same on each envelope - Axel asking them how many days until they come home. This is the left half of each envelope - and 3 original drawings. I hope they enjoyed their summer sleep-away camp enormously! I for one can't wait until they return. I have a variety of sketchbook pages from recent days. 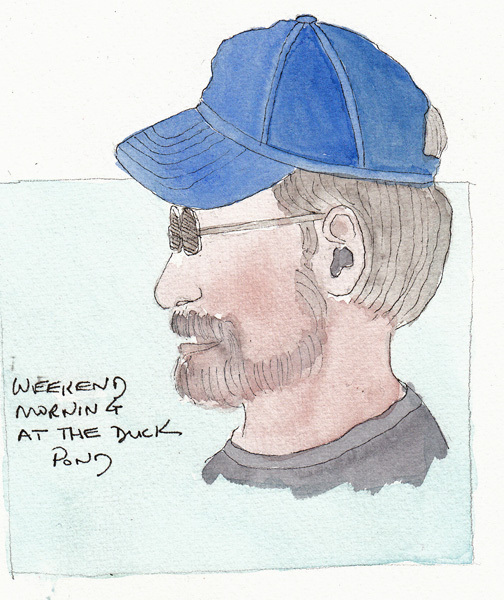 This month I quickly sketched my husband's portrait when we were out for coffee. I do this periodically and he doesn't think any of them look like him. Here he is in his Mets baseball cap. 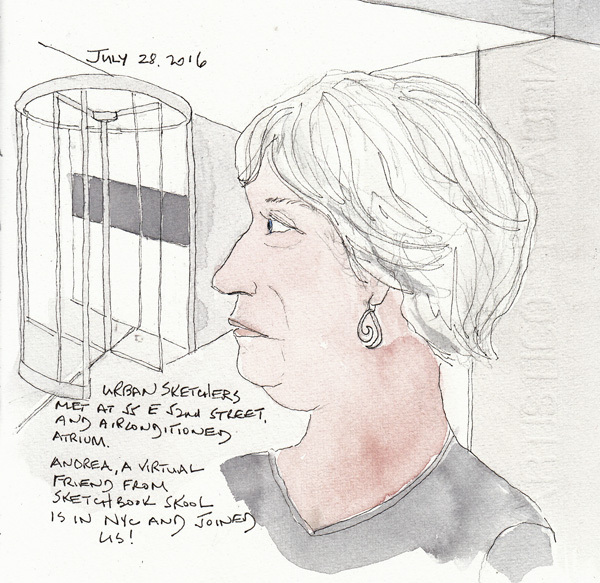 This week I met a virtual friend from Sketchbook Skool in person when Andrea Rubenstein joined our Weekday NYC Urban Sketchers Group at an air conditioned atrium in Midtown Manhattan. Several members sketched Winston Churchill from an exhibit at Chartwell Book Store. I tried to sketch Andrea as we talked. 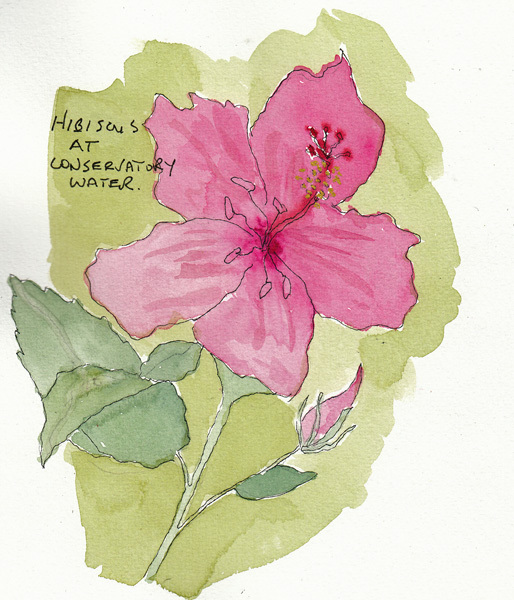 Earlier in July I sketched a beautiful pink hibiscus flower, and then painted it while our group was talking to Andrea. Without thinking, I mistakenly added the stamen from day lilies - and unintentionally made it a rare hybrid! 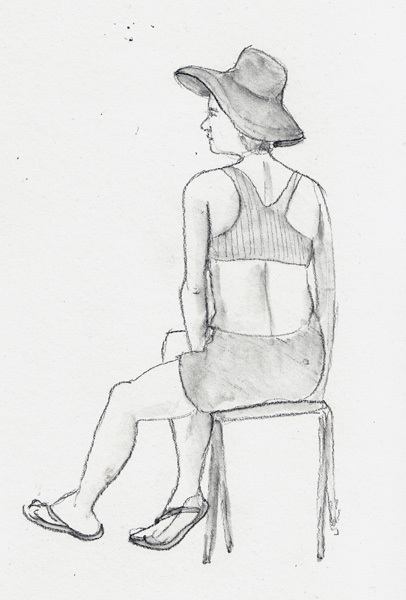 This morning the Central Park Drawing and Art Meet Up group met at the Conservatory Water and I sketched several people sitting at the Café. Battery Park City Conservancy has 3 adult art programs each week. 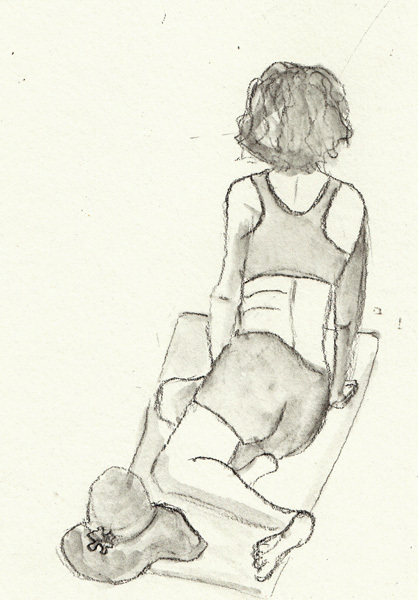 I usually will go Wed AM for an hour to sketch flowers in Wagner Park, but I almost always go to the Figure Al Fresco sessions in the afternoon. 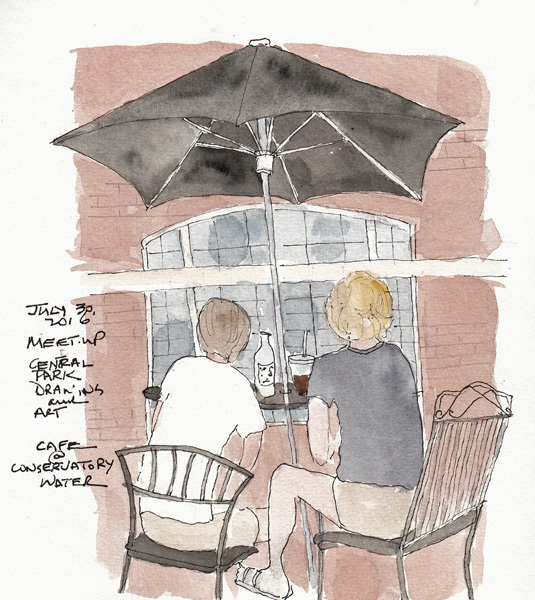 In a lovely spot in South Cove, with river breezes even on hot days, clothed models are scheduled for 2 hours. 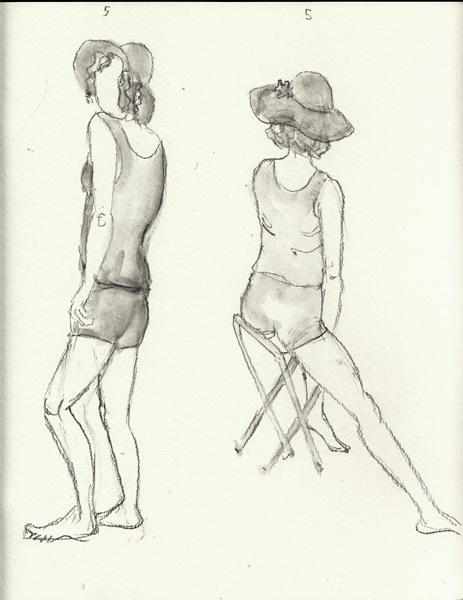 These 4 drawings are of Regina - 3 five minute poses and 1 twenty minute pose. 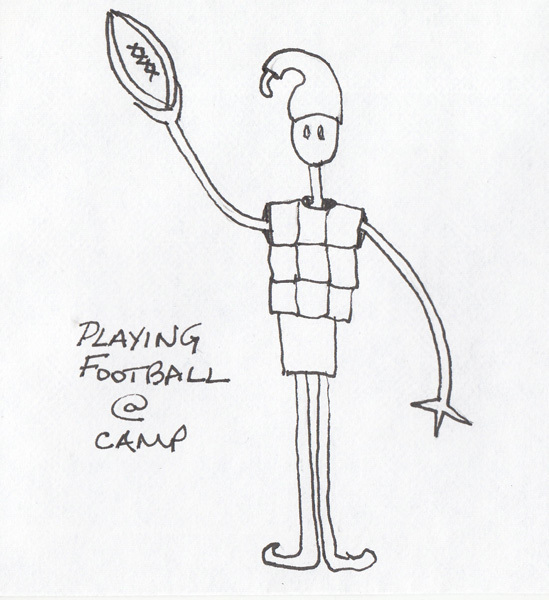 More envelope art on my letters to my Grandchildren - Week 4. I see camp photos of them each morning in a large group of photos taken the previous day. I look for something Axel might like, or might comment on. Here are the 3 drawings together - just left side of envelope photographed. Our return address was scrubbed from the upper left corner on all of them. 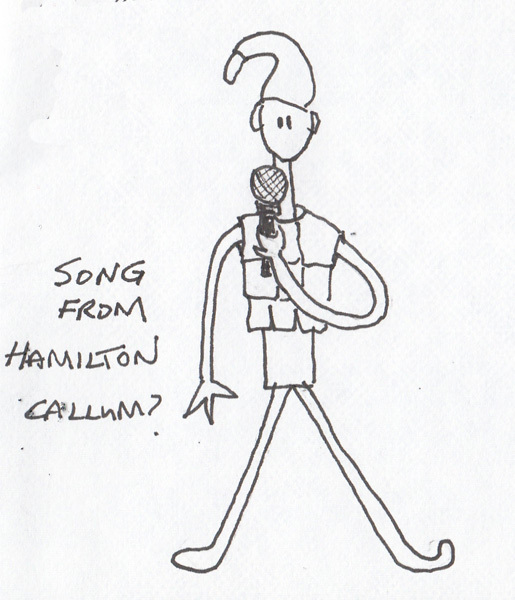 Cal looked like he was giving a talent show presentation, and I'm sure it was one of the songs he easily learned from the Broadway Musical HAMILTON. 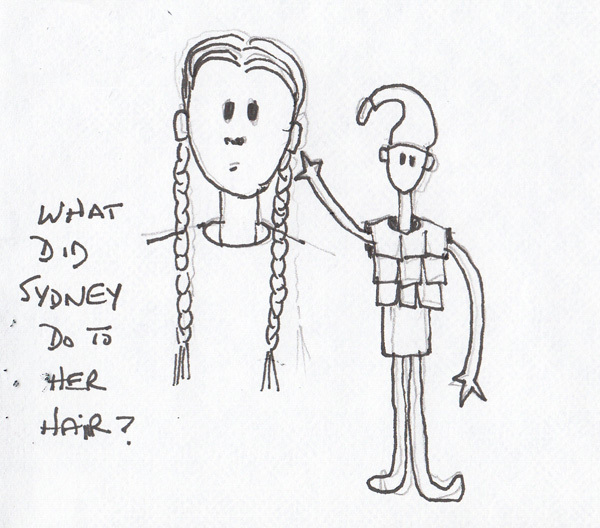 Sydney had long braids in several photos, and I'm sure that Axel would be confused seeing her hair in a different way. 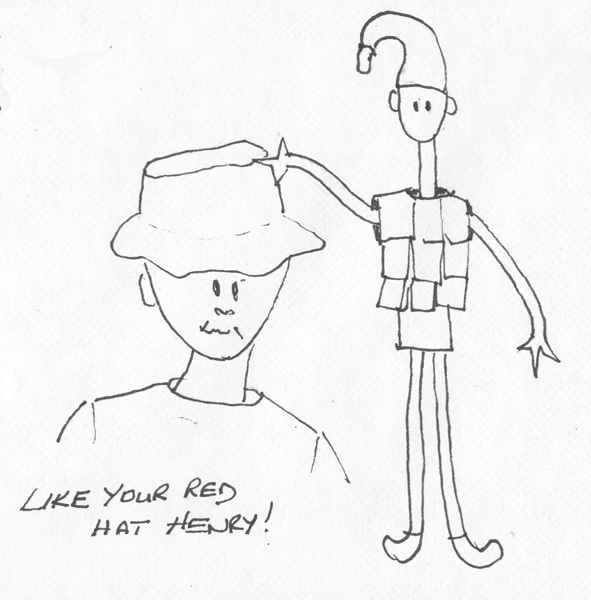 Last week Henry was wearing a red hat that I saw in a few of his photos. Axel already asked for a baseball cap. Now he wants a red hat. I just noticed that this photo was taken before I erased my pencil lines. They were necessary to get the drawing the correct size on the left side of the envelope, and were erased before mailing. 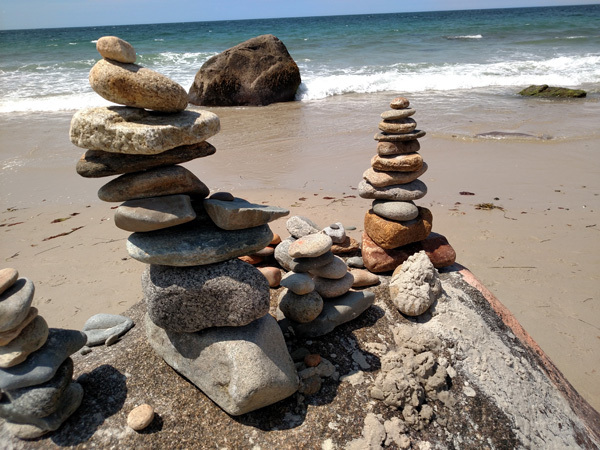 We just returned from a vacation in Martha's Vineyard, extending our time walking beaches while visiting wonderful friends. 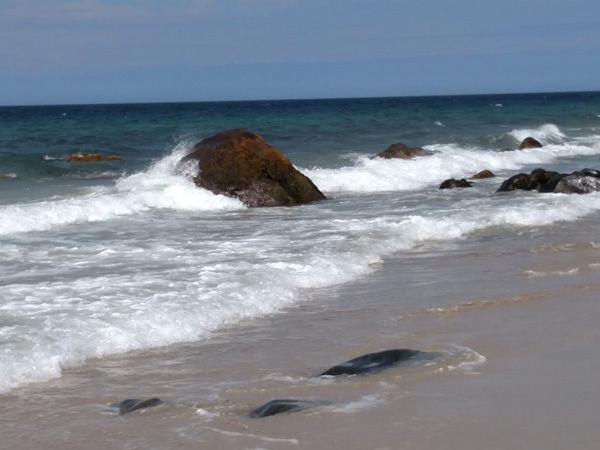 We stay on the western end of the island and the beaches are very rocky. 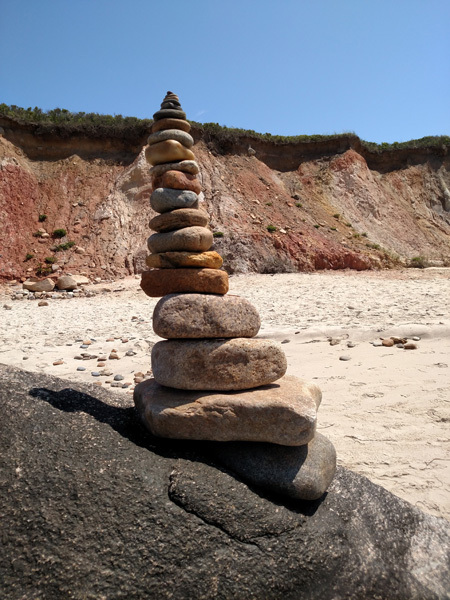 There are many, many rocks that wash up on the beach and I love to watch the ever-changing rock sculptures. 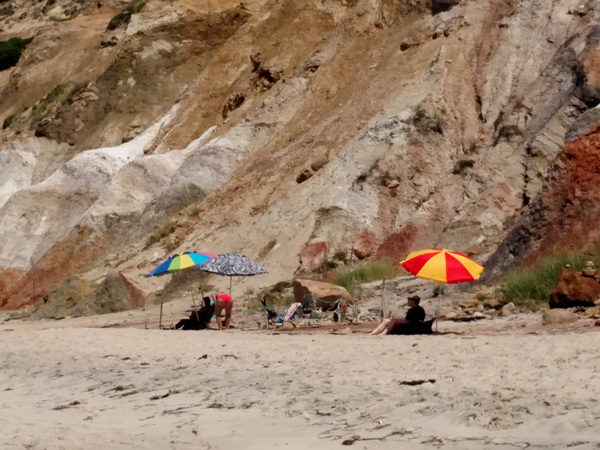 There are high cliffs near the Gayhead lighthouse, and visitors to the beach walk to this section. 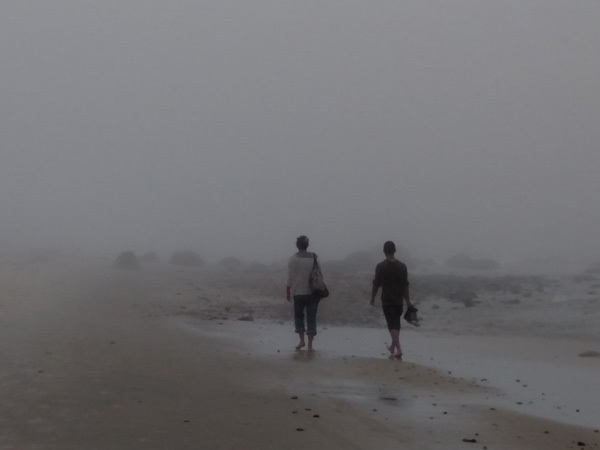 It was foggy when we arrived for our last beach walk, and I love this photo. It was a very relaxing week, but that didn't translate into many sketchbook pages. I do have photos that I may use to continue my painting over the next few days. 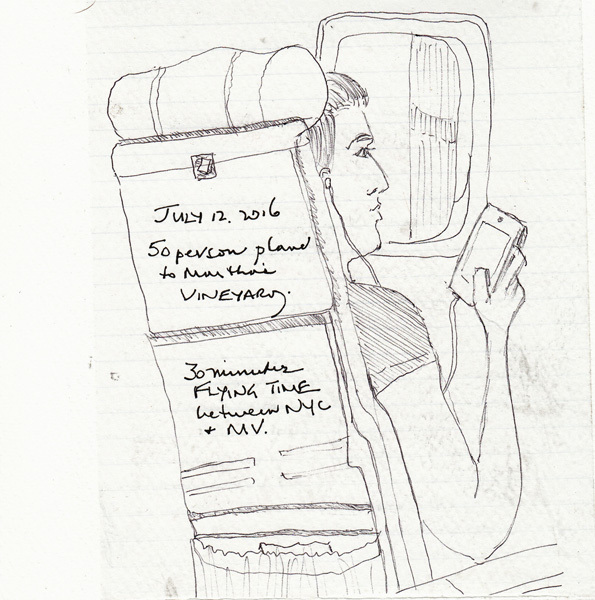 We took a 50 person plane from NYC and I sketched the person sitting in the single seat near the window on a random piece of notebook paper. 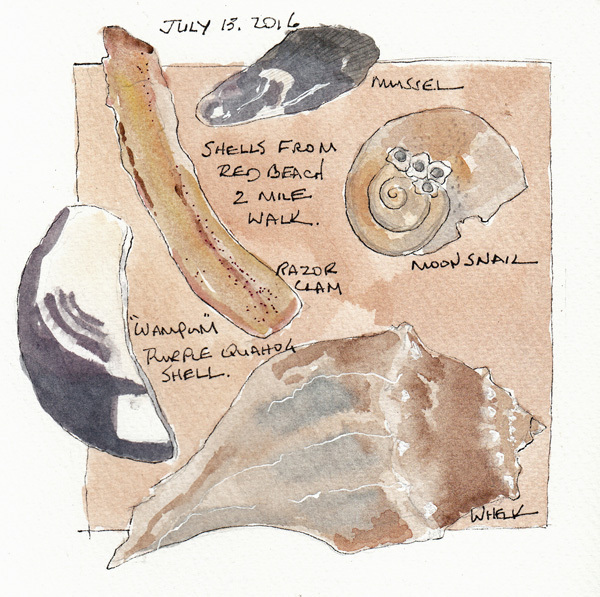 I collected some shells that are slightly different from those I collect in the Hamptons. 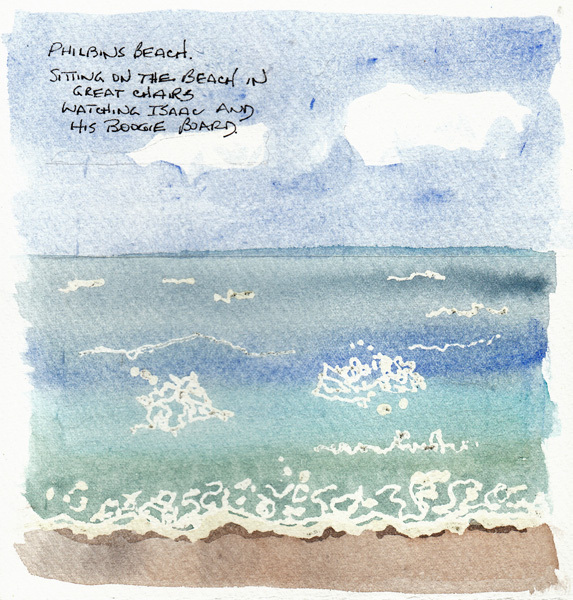 We sat along the beach in really comfortable chairs after one of our walks, in a wonderful breeze, and I painted the ocean. 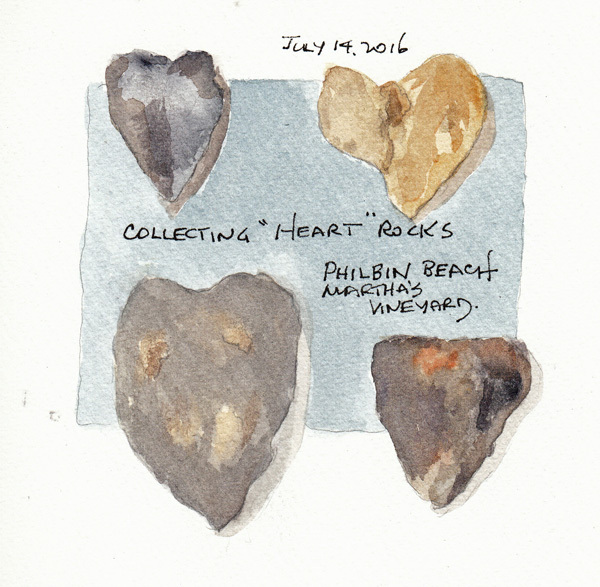 I also collected rocks shaped like hearts that I give to my grand daughters. 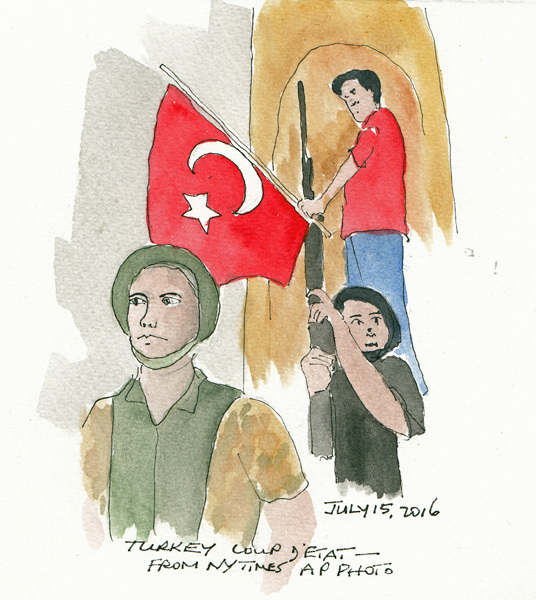 We were constantly following the horrible terrorist events in Nice, and then because Turkey is my daughter-in-law's area of expertise, we watched the events unfolding in Turkey during the attempted coup. This painting was inspired by an AP photo in the New York Times.